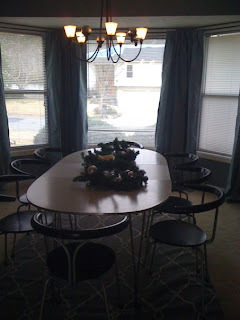 A blog about the joys and fun, and trials and tribulations of fixing up our Roswell home! Found these great prints at a local antique flea market for $6 a piece and hung them over the twin beds in the guest room. Although, they might be a little high. I really like how the traditional prints offset the modern headboards. Let me know what you think! This second guest room sat empty for a year and a half...and now it's not! I still have to paint the walls, hang curtains, paint the headboard and refinish the bedside tables but at least there's furniture. Thanks to my Uncle Matt and Aunt Laurie for the king bed! Me gusta mucho. The light fixture was free due to my BFF's generosity. New glass shades cost $6.27 (each, so x 5 plus tax = less than $34). And 2 cans of brushed bronze Krylon spray paint cost about $6.00. 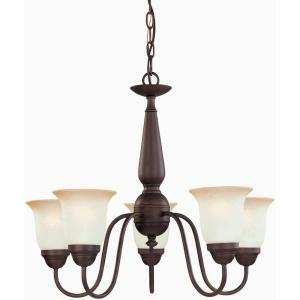 So total for a Pottery Barn-esce light fixture cost me $40 (this was the look I was going for: http://www.potterybarn.com/products/cecilia-hurricane-chandelier/?pkey=cchandeliers). Which is a lot easier on my wallet than $400+! Hope ya'll like it as much as I do! And thanks for stopping by My Roswell Home!